The kitchen faucet and garbage disposal are installed by the plumbers after the counter and sink is put in place. There are many different styles, colors and types of faucets available to you that can suite virtually any need. We chose a faucet with a detachable spout for easy cleaning of dishes and washing of produce. Some options include sprayers on the side of the sink, built in soap dispensers and purified water dispensers, all attached to the base of the faucet unit. Another important feature, the garbage disposal, is plumbed in to the drain line. There are different types of kitchen sinks available in the market that you can choose. The characteristics you are looking for in the sink will depend on your needs and the budget you have available for the sink. The style as well as the durability of the kitchen plays a vital role in the selection of your kitchen sink. Here are some of the common choices for sinks. The stainless steel sink is the most common type of sink found in most homes since this type of sink is known for its durability, easy maintenance and sleekness. If you choose a stainless steel sink for your kitchen, choose a stainless steel kitchen sink that is neither too thick nor too thin. A thin stainless steel sink is prone to damage such as dents and scratches, which can be unsightly. The good thing about stainless steel is its stain resistant feature which is a good thing considering that a kitchen sink is prone to staining. A stainless steel kitchen sink is a very practical choice for a kitchen, however if you want something unique for your kitchen or you have a modern taste, you may want to choose another material that is more suitable to the design of your kitchen. Quartz stone composite kitchen sinks are considered the most durable of all sinks. They are scratch resistant and heat cannot damage them. However this kind of sink is not easy to find, but then there are ways that you can check the availability if you really want a sink made from quartz stone. This type of sink is affordable and it can add more character to your kitchen. 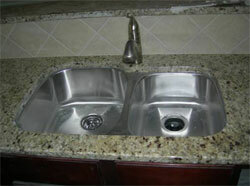 A granite composite kitchen sink is known to be the most expensive and is also very durable. Installing a composite sink in your kitchen is definitely worth the price you paid for it since it is known to withstand heat. It does not crack, chip or stain. Fireclay sinks are made of molded clay that is cooked at an incredibly high temperature. It is a good choice for you if you are looking for an alternative kitchen sink that adds personality to your kitchen and that is reasonably priced. It is nonporous, chip and heatproof. It is also easy to clean. A copper sink is also a good choice for a kitchen sink due to its durability and rust proof features. It is also considered a healthy choice for a sink since it has anti-microbial properties that prevent the growth of harmful viruses and bacteria. A copper sink can be customized according to your specification, which is good choice if you have an eclectic taste. Cast acrylic is a good choice for those that are budget conscious. It is made of plastic and fiberglass. The sink is easy to clean, has a sleek surface and is easy to maintain. There are a number of features to consider when buying a sink, such as the size and depth of your bowl. The size of your kitchen sink will depend on its usage. If you love to cook and entertain large groups, you need to have a bigger sink to accommodate your needs. However, you need to consider the interior width of the cabinet below it to make sure it fits. Another option when choosing a sink could be to consider having an island sink installed (if you have an island in your kitchen). This could provide more than one place to use a sink if entertaining a large amount of people. Choose the number of bowls according to the size of your kitchen sink. If you choose a small to medium size sink, a single bowl sink is the best choice to maximize the space of the sink. A larger sink can be divided into two or more bowls, which will depend on your specification and needs. The depth of your bowl will also depend on the function of your kitchen sink. If large pots and pans will be constantly used in your kitchen, a deeper bowl is what you need. The typical depth is 8 inches, however the depth of your bowl should also depend on your height. A kitchen sink is an important feature of a kitchen; choose a sink that combines functionality and style that fits you and your budget. Visiting local building supply stores and plumbing supply stores may help make this decision easier. Usually, these stores have many types of sinks on display. Seeing the sink in person will help you make the best decision to suit the needs of yourself and your kitchen.